High viewability rates remain an important objective for brands and agencies and our metrics show an increase for every quarter in 2018. 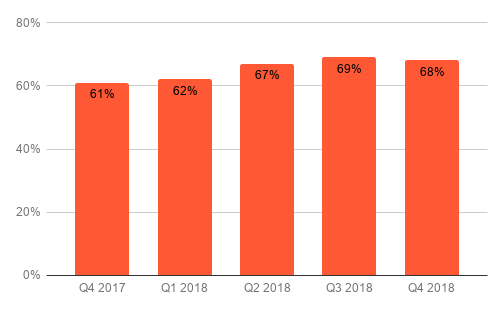 Viewability increased from 61% in Q4 2017 to 68% in Q4 2018, landing at a full year average of 67%. 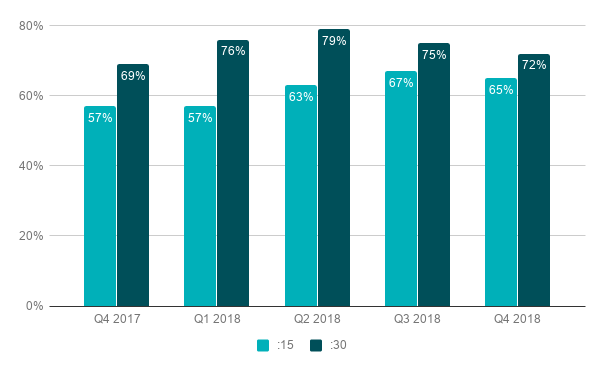 The viewable completion rate remained steady at 76% for the first three quarters of 2018 then saw a nice increase in Q4 to 80%, a significant rise from the 70% rate in Q4 2017. Viewability is consistently higher on premium publisher sites than on aggregators, usually by a large margin, and this year proved no different than previous years. 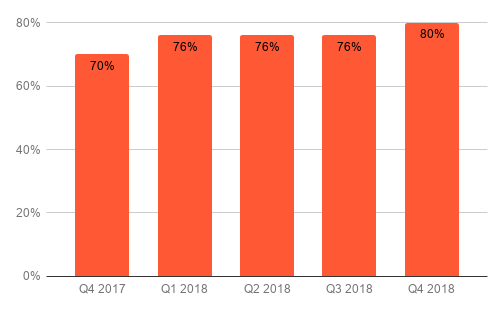 The viewability on premium sites grew from 73% in Q4 2017 to 84% in Q4 2018. On aggregator sites, the increase was smaller, rising from 58% in Q4 2017 to 62% in Q4 2018. 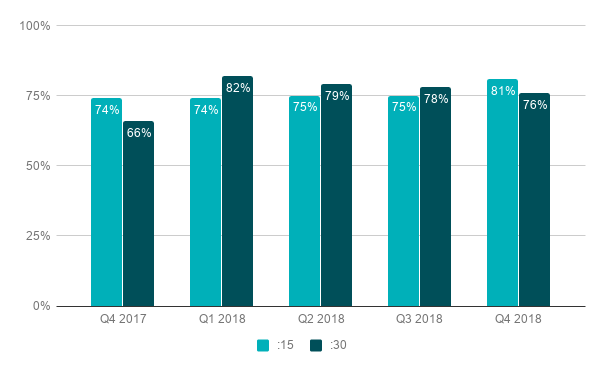 Viewability of 30-second ads consistently earned a higher percentage of impressions than 15-second ads in 2018 and outpaced 2017 quarter by quarter, ending with year-end average numbers of 76% for full year 2018 vs. 65% for full year 2017. Viewability for 15-second spots increased at a slower pace, landing at an average of 63% for full year 2018, up from 57% for full year 2017. Viewable completion rate is a subset of viewability, above. 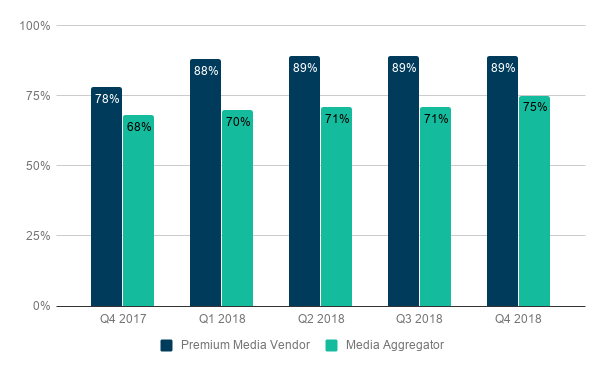 In 2018, premium publishers generally held a large lead over media aggregators, especially in Q2 2018 when premium sites hit 86% in viewable completion rate and aggregators fell to 71%. 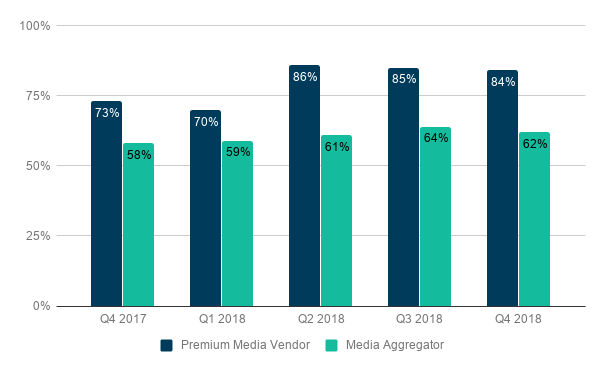 At year end, viewable completion rates for premium publishers reached an average of 89% for full year 2018, while aggregators averaged 72% for the year. In 2017, 15-second ads definitively dominated 30-second ads in viewable completion rate. But in 2018, 30-second ads edged into the lead experiencing higher rates of growth in viewable completion rate than the shorter spots. Between Q4 2017 and Q4 2018, the viewable completion rate for 30-second ads grew by 15% ,whereas the growth rate for 15-second spots was about 9%. Full-year averages for 2018 were similar, with 30-second ads showing an increase in viewable completion rate of 18% vs. 6% for the shorter ads.